2 bedrooms, 2 bathrooms, living room, kitchen/dining, balcony. MW, W/D, Cable TV, WiFi/DSL. BEDS: 1 King, 2 Single, sofa bed. Accommodates 6. POOL PRIVILEGES @ DAYS INN. NO PETS, NO SMOKING. Bed Linens and Towels are not provided at this unit. Renters can bring them from home or use a linen rental service. We welcome you to our beautiful island – Georgia’s Jewel. From festivals to family getaways, we know how to find just what you are looking for. We hope you enjoy your vacation and all that Jekyll Island has to offer. Please let us know if we can be of any assistance before, during, or after your stay. We look forward to making your vacation dreams come true. *The listed Nightly rate is based upon a seven (7) night stay or longer. Stays of less than 7 nights, when available, are at a higher Nightly rate. In both instances, fees and taxes are additional. Great location close to the beach with easy access. Apartment was clean and spacious. Great experience will book again. Overall our visit was great - we have stayed in the same condo unit for 5 years - almost the same weeks in June. I would suggest the owners consider purchasing some new bed pillows - especially for the master bedroom. Also the kitchen is missing a few key things - like a spatula. We usually bring our own things - but some things we just assume will be there. Larger trash cans outside would also be nice because it is a bug infested scary area to take out the trash. Someone needs to do a deep cleaning of areas like inside thew windows, baseboards, etc. We had a wonderful restful time staying at Atlantic Breeze #5 on Jekyll island. The unit is a little old but very clean and so close to the beach (less than a five minute walk) and also comes with a pool pass at the Days Inn. And the price is very reasonable. We will definitely stay here again. 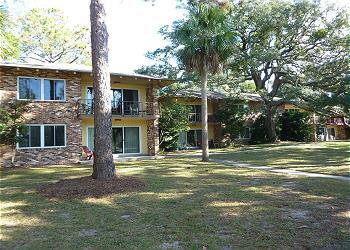 We have rented through Jekyll Realty many times, this was the first time renting at Atlantic Breeze. We were very happy with the size and location of the apartment and the price was reasonable. It could use some upgrades to furniture and mattress, but it gave us exactly what we needed peace, quiet and a beautiful Island to experience. The folks at Jekyll Island Reality were dealing with problems from the hurricane aftermath so we didn’t expect a lot of attention. They worked with us to adjust our week after power and water were restored. The Island itself is a remarkable place, always something new to enjoy. Since we were there to rest we never left the Island all week, just walked everyday. For our 50th anniversary we went to Tortuga Jack’s, fast service, good food and beautiful view. We can’t wait for our next visit. We had all the basic necessities and some extras. Beautiful location. *Clean the window seals so the windows can be opened on occasion. *Advise Smokers they should go 15' or so outside to smoke (the odor drifts upwards to our balcony pretty frequently). *Perhaps leave some of those red plastic baggies and a note explaining why it's important to use those when walking on the beach at night. I have stayed here before, and this place still remains a great place to stay - ocean view ( even though very slight) without the ocean view prices!! It is less than a 3 minute walk to the beach. Property is clean and just what you need in a vacation spot! We rented Atlantic Breeze # 5 for a week and we we we very happy with our decision. Our other family members stayed at the nearby Holiday inn .The apartment was exactly as pictured on the website. We found the apartment very clean except for the flooring. . This was a very spacious and comfortable home away from home. . My other family members were staying at the Holiday Inn. Every night they came over after dinner for ice cream and it was so nice to have a place big enough for all 14 of us to comfortably gather. And it was in walking distance!. The beach was so close, I walked every morning at sunrise. I also felt very safe . I would love to come back again . Jekyll Realaty took care of a shower head problem immediately for us. We loved the key code access, no looking for and keeping track of the key. This was our first trip to Jekyll Island and we had a great time! The condo was very nice - perfect for our family of five, a short walk to the beach, and centrally located on the island. Thanks for making our first visit to Jekyll Island great! Jekyll Island Property Sales & Management, INC.